On October 29th the Philadelphia Flyers fought back to win “The Battle of Pennsylvania,” 3-2 over the Pittsburg Penguins. Pittsburg dominated the first period leading to 1-0 Penguin lead. The Flyers looked flat on the ice, and forward Danny Carcillo knew that something was missing. “In the first period we were shaky with the puck. We weren’t moving our legs, and weren’t good on the fore-check. We need to start the second period with a lot more intensity if we want to win this game,” said Carcillo. Lead by Carcillo, the Flyers came out in the second and third period looking like a completely different team. Carcillo scored the first goal of the second period to tie the game 1-1, and scored another goal in the third period for the win. Once the Flyers found the right level of intensity they were faster, more physical, and flat out playing the Penguins who controlled the first period. Playing with the proper intensity helped the Flyers come back and perform their best on the ice. Intensity deals with how psyched up or pumped you are during a game. In hockey when your intensity is inconsistent, so if your performance. Some games, you might be psyched up and ready to play while other times, you might lack interest or feel bored, which hurts affects your ability to concentrate. Players with low intensity may have trouble anticipating the play, feel sluggish and just go through the motions. 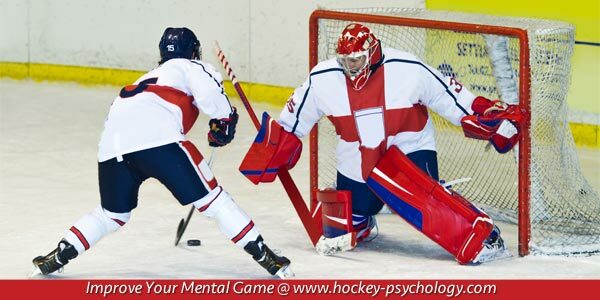 A lack of intensity can lead to mental errors such forgetting the play or losing the puck in your own end. In order to increase intensity, you want to challenge yourself in the opening minutes of each period by setting goals that help you focus on your performance. For example, you might challenge yourself to skate faster than your opponent, make crisp passes, or have two more shots on goal. An excellent time to boost your intensity is during your pregame warm-up. Not only do you need to warm-up physically, but also mentally. You want to use your warm-up and pregame routine to help get in the right frame of mind and emotional state before competition. Listening to music is one way to do this. If you need to increase your intensity, listen to fast, upbeat music. If you need to decrease your anxiety, listening to slower paced music might be more helpful to you. 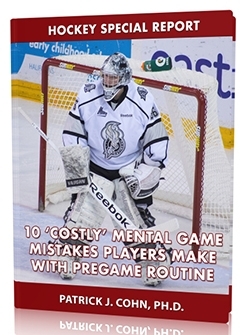 In summary, it is important to monitor your pregame level of intensity and take the necessary steps to boost your intensity prior to the game. Get your heart rate up before the game. Challenge yourself to play well and set small goals to go after and don’t play your game.